Make sure you’re listening to MTG Fast Finance with James Chillcott (@mtgcritic) and I! New episodes usually land on Thursdays. We’re on iTunes and Twitter @mtgfastfinance. Regardless of your opinion on this weekend’s Pro Tour, whether you were rooting for or against the Eldrazi, we should all savor this moment as one in Magic history. It’s not often that a deck takes up six of the eight slots in the elimination rounds. Elves did it at Berlin, Flash Hulk did it in Columbus, and Affinity and Tolarian Academy have done similar. What we’ve seen here is actually the goal of every single team that shows up to a Pro Tour: break the format so thoroughly that their deck dominates the event. It’s only due to a balanced meta and power level that this doesn’t happen every time. When a team’s best laid plans do come to fruition, it means either Wizards messed up and put cards into a format wildly better than their peers (Affinity, Academy, Eldrazi?) or a list was discovered that totally sidestepped everything everyone else was doing (Elves). You can tell the difference because decks from the former camp end up getting banned, and decks from the latter are beaten back into place by a metagame. 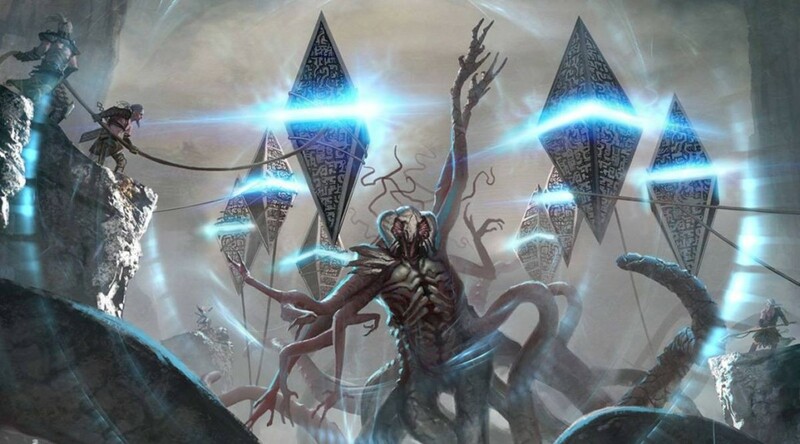 Of course, the question that should be on everyone’s mind today (rather than already having a completely formed opinion about it) is which type of deck Eldrazi is. On the one hand, this deck does some fundamentally busted stuff. You’ve got eight lands that produce two mana (or more!) on turn one. The last deck to generate that much mana that fast was Amulet Bloom. You can kill people on turn two with triple Eldrazi Mimic off an Eye of Ugin on turn one followed by Eldrazi Temple, Simian Spirit Guide, and Reality Smasher, or you can play a long attrition game with Eye of Ugin eventually ensuring that you never run out of gas until one of you is dead. The last deck to kill on turn two and still be capable of playing a long game was…Amulet Bloom. I’m surprised the M15 version of Chord is more expensive than the Ravnica version. And I’ve been doing some checking here and there, and it seems like the Conflux version of Noble Hierarch has been eclipsed by the Modern Masters 2015 version as well. I’m hoping someone here on the site can do an overview of the versions of cards where older is not necessarily better. 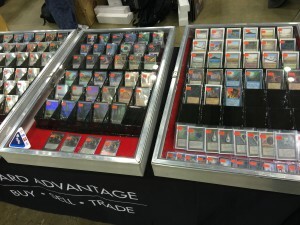 For the record, I like the old Ravnica Chords just as well, or better than the new ones, but what are the price prospects of the post M15 card frames vs. the modern card frames? There seems to be prices on these that are antithetical to past price trajectories. There is definitely some curious price behavior with different card versions. Look at Sulfurous Springs right now; 10th and 9th Edition copies are all but sold out, while there are numerous copies of the various older printings available. It’s clearly not so simple as “older = better” anymore, yet nor is it “newer = better.” I’m hard pressed to say there’s enough data out there to make informed statements though. I honestly think it depends on the availability of NM cards as opposed to SP or MP cards. The price of NM M15 Chords is/was closer to the SP price (compared to Ravnica) and we all know that if you are Buylisting you want NM copies. I think that “speculators” are picking up every NM copy of Chord they can find because they expect buylist prices to eclipse the current market price at some point. It was pretty damn easy there for awhile to buy multiple NM M15 Chords for cheap, on the other hand, you actually had to hunt down the NM copies from Ravnica. I think that once the NM copies of M15 Chord have all been bought up under $15 and we are left with a ton of SP/MP copies on the market, the prices should even out and increase together somewhat. That is until… All those speculators hit that arbitrary buylist number (maybe $10? $12?) and unload all their NM M15 Chords to vendors. That will probably crash the price of M15 chord back below the Ravnica version. Just wanted to give a heads up on this trend. I’ve talked to plenty of people with literal STACKS of the M15 Chord of Calling, just waiting for the right time to ship them to a buylist. The time will probably come in the next year or two. Glad I got a playset of each version last year. Imagine the folks that bought 20-100 copies though? Shipping out buylist orders of 20 cards for $200 with an investment of only $60? Sounds good right? As for which art is “better” who knows? Some call the Ravnica version Bird Chord and the M15 version Beast Chord. I guess it depends if you like birds or beasts more? I like both and I’m just happy they don’t have the same art either way. I prefer new Noble Hierarch over old ones, because it is harder to make fakes due to small foil mark. Why I believe the card prices on newer releases are higher than their older predecessors is the new security measures taken by Wizards in their cards to assure players and collectors alike that the card is genuine and is not a duplicate. The security in knowing your money is correctly spent is creating a demand that people don’t want to give away for free. Example: you have an M15 Chord, and someone comes by and says they like the artwork better on it compared to their Ravnica copy, and they would like to do an even trade for trade. You, as a kind trader at your local game store, don’t see why not. After you trade, you look to get your collection valued, and in that process, the analyst tells you the Chord you now have is fake, worth nothing, and not for legal play. The long and the short of it is security of quality presents itself with a higher price than the original. I do not understand that either. The old versions were worth a bit more until the recent spikes though. The MM2015 cards scratch very easily and are glossy. Do not understand…. Maybe price went up more because the new versions were easier to acquire and people wanted them to match so bought/buy the new ones instead. With chord, the newer version has been cheaper forever so everyone has been buying that version. Supply of that version has finally dried up, so websites have increased their buylist price to get more copies in. So they have also increased their sell price. That means people will soon be buying all the older version so that will increase in price as well. It will end up higher than the new art again soon. There might even be a spike on it cause there is little supply of the old art already. Future Sight Tarmogoyf will NOT be eclipsed in price by a MM set printing. John does a great job explaining what likely has happened with Chord…I believe players like to have matching PLAYSETS of cards. So it is easier to buy 4 M15 Chords, 4 M15 Urborgs (I think the M15 might be more expensive according to this site, or they are equal), 4 MM 2015 Spellskites and Noble Hierarchs, etc. The supply dries up and then prices go up as John explained. I’m still a little bewildered by this as well, but it is what it is. The new Chord does also have a richer printing, the Ravnica one does look a little faded even on a good day.